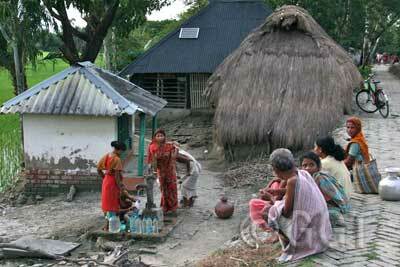 Village in Sundarban, West Begal (photo by Geringer Global Travel, India tour operator). On this tour of East India, experience the captivating regions of West Bengal and Orissa in this two-week trip. West Bengal is a thrumming center of humanity where, over the years, Indian ideas have flourished. It was home to the freedom movement, and has a long history of drawing the finest artists, spiritual thinkers, writers and revolutionaries. This sliver of a state houses a dense population and a remarkable diversity of geography, from the flat Ganges plains to the towering Himalayas. Orissa is renowned for its temples, the grand remembrances of when this region was flourishing in the 13th century. Hordes of pilgrims visit this area and its fascinating collection of ornate temples, infusing the region with a rippling energy. Yet it also has deep tribal roots—many of the tribes here live on the fringe of mainstream society, still maintaining their vibrant traditions in a world that has largely moved on. Enjoy this fascinating glimpse into two of India’s most enigmatic states on this tour to East India with Geringer Global Travel. Kolkata is a city pulsing with energy: intellectual, culturally and artistic. Home to four Nobel laureates—Ronald Ross, Rabindranath Tagore, Mother Teresa and Amartya Sen—the city was the birthplace of many modern movements in art, cinema and theater. It was also where the country’s march toward freedom began. Explore the beautiful architecture and busy, narrow lanes in the north of the city, and visit Victoria Memorial andDalhousie square, an historic hub surrounded by charming buildings. Visit Dakshineswar Temple, a complex built in 1855 where the saint Sri Ramakrishna attained his enlightenment, and a well-known pilgrimage spot for Hindus. In the afternoon visit the Mother Teresa House, an orphanage that provides children with clothing, food and a quality education. Stop at a rural bazaar, a charming local tea – shop and a fishermen’s village before arriving at Godkhali, where you’ll board your river cruise. Lazily float down the Hogol, Gomor, Durgaduani and Gumdi before arriving at Sundarbans Jungle Camp. Later, wind through creeks and canals for a fascinating birding and game cruise to the Sudhanyakhali Watchtower, a great vantage point for spying wildlife. Sudarban, a UNESCO World Heritage Site, is the largest estuarine mangrove forest in the world. Today, continue experiencing the fascinating local wildlife and gorgeous scenery here on a full-day game cruise and birding tour to Netidhopani and Dobanke Watchtowers. Return to Godkhali by motorized boat and drive to the Kolkata airport, where you’ll board your plane to Bhubaneswar and onward to Puri, one of the biggest pilgrimage centers in India. Puri Beach is also known as one of India’s finest, and a great spot to soak in the sun on the Bay of Bengal. After breakfast, your tour in East India continues. Visit the 12th-century Jagannath Temple. The temple is closed to non-Hindus, but its carving and moldings—as well as its 190-foot tower—can be viewed from the outside. Later, visit The Temple Chariot of the Sun God, the elaborate, 13th-century architectural wonder on the Bay of Bengal. Drive back to Bhubaneswar, visiting a village dedicated to appliqué—old Orissan temple art—along the way. Later, marvel at the Dhauli Ashokan rock edicts on the banks of the Daya River. They were the works of Emperor Ashoka, ruler in the 3rd-century BC and perhaps Buddhism’s greatest benefactor. Today, explore the Bhubaneswar Temples. Some 500 of the original 7,000 remain, and are superb architectural specimens. You’ll also visit the Yogini Temple–which reflects the strong tantric traditions evident in the 600s AD—and the fascinating Orissa Tribal Museum. Fly to Kolkota and then onward to Lucknow, which was once the literary locus of Mughal India. Enjoy a tour of this historic city, including the Great Imambara—a majestic 18th century Muslim congregation hall—and the British Residency. Then wander the chowk bazaar, where you may witness the ancient practice of perfume making. Today, explore more of Lucknow, including Hazratganj, the modern marketplace that gives you an insight into everyday life in the city. In the evening, savor some local cuisine at Nawab’s Haveli. The cuisine in the region was made popular by the Nawab of Awadh who, to deal with food shortage, ordered his men to cook food in huge handis(vessel) to feed the hungry people. At dawn, see the banks of the holy Ganges come alive on your sunrise boat excursion. See ancient sculptures at theBharat Kala Bhayan museum and experience Sarnath, site of the Buddha’s first sermon after attaining enlightenment. Visit Benaras University and Vishwanath Temple, an impressive edifice dedicated to Shiva. Travel to Delhi today. You will experience the many facets of this captivating capital—both the modern and the ancient—as you explore both New and Old Delhi. Experience Old Delhi, from the opulent Red Fort and massive Jama Masjid mosque to the narrow bustling lanes ofChandni Chowk. New Delhi’s Gateway to India and the Presidential Palace showcase modern history, yet the 12th century Qutub Minar and Humayun’s tomb show that even this new part of town has an ancient past. Walk throughNizzamuddin Basti (colony), a medieval settlement where the tomb of the famous 13th century Muslim Sufi Saint Nizzamuddin Auliya is located. Your East India tour comes to an end as you transfer to the Delhi airport for your flight home. This is just a suggested itinerary—we’d be happy to customize an itinerary to fit your needs. Whether you’d like to choose your own dates, would prefer a shorter or longer journey, would like to mix and match accommodations or simply need something to fit your budget, please contact us at 877-255-7438 or email us at info@geringerglobaltravel.com to discuss how we can create a personalized India tour for you.